bedturning/lecture in Las Vegas, Nevada on November 18th at the Las Vegas Quilters Guild Meeting at 6:00 p.m. at the West Charleston Library. Earlier on the 18th I will be doing quilt appraisals at Nancy's Quilt Shop from 10:00 a.m. to 4:00 p.m. And on the 19th I will be appraising at The Fabric Boutique from 9:30 a.m. to 12 p.m. I am a nationally certified quilt appraiser, trained and certified by the American Quilter's Society (AQS) in appraising antique, vintage and newly made quilts including art quilts. Appraisals are needed to properly insure both old and new quilts so that they are valued as more than blankets or import quilts, in case they are damaged, lost or stolen. 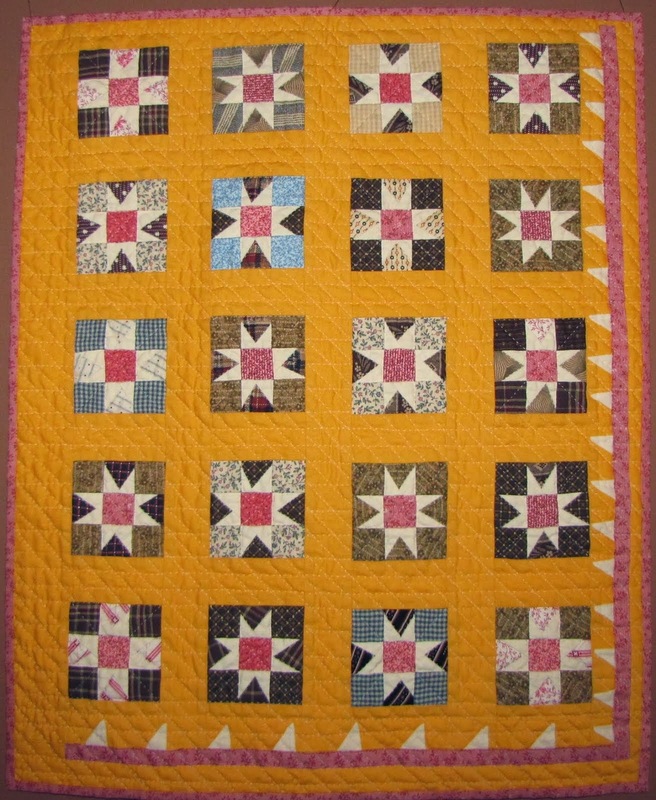 Appraisals can be written for fair market value if you are interested in selling your quilt. Appraisals are also done for estate, tax and donation values. And an appraisal given along with a newly made quilt or a family quilt leaves no doubt as to how valuable the quilt is and that is should be treasured (not used as a dog bed or a picnic blanket). This quilt I made for the Alliance for American Quilts is up for auction right now on eBay until tonight. 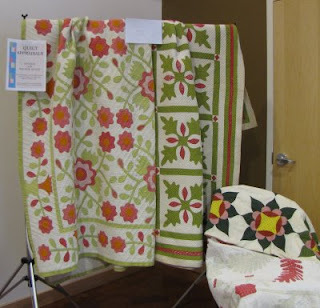 I was very pleased that it was an honorable mention award winner in the contest and shown in Houston and on 2 Alliance newsletters but even more thrilling to this quilt historian is that it will be part of the Quilt Index run by the Alliance. What an honor to know that my quilt will be in such great company and have a permanent place in that great repository and resource of quilt history. The bidding for each quilt will start at $50 and each 7-day auction week starts and ends at 9:00 pm Eastern. All proceeds will support the AAQ and its projects. This is a Pennsylvania signature album quilt dated 1879, purchased recently from Texas quilt dealer John Sauls. I've done a little research via ancestry.com and found that it is from Tuscarora, Bradford Co., PA. Some of the family names are Hall, Montgomery, Chamberlain, and Lake. The quilt has been washed and many of the signatures are faint and/or only have first names. A number of blocks have very small buttonhole applique stitch and fine chain stitch stems. 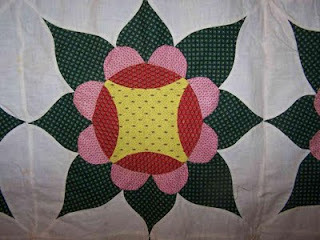 In addition to the variety of mostly floral motifs, it also has a variety of quilting designs. I'd love to hear from anyone from that area of PA and anyone who owns or has seen a similar quilt. Civil war era antique quilt top from Pennsylvania, Lancaster Co. The pattern is a variation of King David's Crown, Brackman #3649. Blocks were hand pieced not appliqued and then joined by machine. One of the things I really like about this pattern is the secondary design in the off white background-a cross or 4 bells. Once I saw it, it is now the first thing I see when looking at the quilt; it would have been lost if the maker had added sashing. I really enjoy these red and green quilts and this is another I may try to reproduce-just a few blocks or maybe one and I'd have to applique it as I don't have the curved piecing skills of this maker. Another top for my own quilt history and appraisal study and to share with my students. Enjoy. Here is the 1876 centennial preprinted patchwork in the madder brown colorway. The maker really enjoyed using this fabric throughout the log cabin quilt, reminds me of the way many of us used the millennium 2000 fabrics (not unusual since they are both commemorative/moment in time prints). This fabric is featured in Trestain's Dating Fabrics 1800-1960 and a large section is shown on page 75. It is also shown in several other places in the 1860-1880 section (pg 77 3rd row middle -paisley swatch; pg 78 1st row -left swatch, 2nd row middle -flag swatch, and 3rd row-left and middle swatches). I have previously posted a scan of yardage in the red madder colorway, click here or scroll down to view that post. I don't know if there are any other colorways of this print. It is interesting to note the 1776 Liberty bell square pictures war time with cannons firing and cannonballs flying, swords, bayonets, flags and drum while the 1886 Peace shield square shows peace time with peace dove, liberty cap, plow, crops and a new day rising. I've heard that this fabric replicates an actual pieced quilt of the era, but I haven't had time to research this yet--does this ring a bell with anyone? 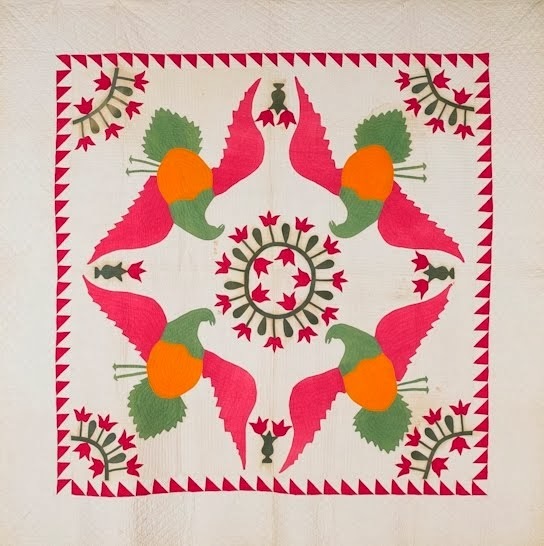 This circa 1890 log cabin quilt is actually a coverlet or summer spread, the logs are hand pieced to muslin foundation squares which are then pieced/appliqued together covering raw edges. There is no quilting although the hand piecing looks like quilting from the back. The coverlet is bound with the centennial fabric and a red/black buffalo check and other fabrics. Don't forget to click on the photos to enlarge them and look at the other fabrics from the last quarter of the 19th century used in the coverlet (mourning gray prints, chocolate browns, shirtings, etc.). 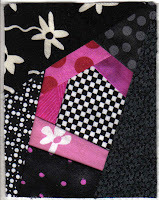 What I'm working on --a crazy quilt for this year's Alliance for American Quilts challenge. 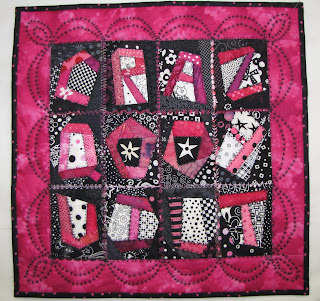 They are currently accepting entries/donations of 'crazy quilts' which will be auctioned this fall on eBay to help with their mission of preserving American Quilts and quilt history. In honor of their 16th year, the quilts are 16 inches square and must be postmarked by June 1, 2009. If you are a quick worker, there is still time to join in and "there's room for all kinds of crazy". Anyone can buy a quilt on eBay to help support the Alliance. I'll post when it is time to vote for your favorite and again when it is time to starting bidding. I'm taking the theme literally and spelling it out, as you can see in the sneak peek block. Drafting paper pieced letters in a log cabin, cq format with strong graphic appeal of black and white and hot pink/fuchsia. What a lot of fun for a great cause. If you haven't visited the Alliance yet, finish reading my posts and then hurry on over to their site where you will find many treasures including the Quilt Index one of the best quilt research resources. 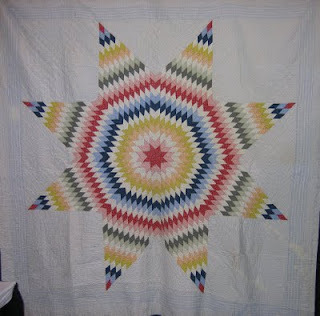 I just posted on my contemporary quilt blog about the favorite quilt I've made as part of the 1st annual virtual quilt show hosted by Amy- Park City Girl blog and then decided to post about my favorite antique quilt too. I couldn't decide on just one, so I'm showing my favorite red and green quilts. The 3 quilts and one top, are all from the civil war era, c. 1865, shown left to right- Rose of Sharon or Whig Rose, Oak Leaf, King David's Crown (top) and Princess or Prince's Feather. You can see more about the two hanging quilts by scrolling down about 2 posts. If I had to pick only one -- it would be the whig rose. It is so bright and cheerful and has excellent workmanship in both applique and the triple rod quilting (3 lines close together). I can't help but smile each time I look at it. Thanks for visiting, please leave a comment. 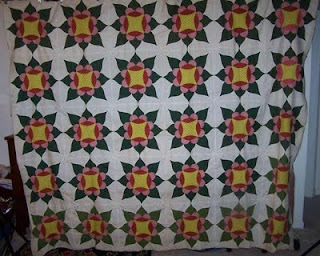 Also let me know if you would be interested in participating in a virtual antique show quilt. After seeing the success of Amy's show, I'm thinking it would be very fun and educational. There are over 220 people participating in the current virtual quilt show which is an alternative show for those of us who are unable to go to IQA Spring Quilt Festival in Chicago. Please go to Amy's blog to see the show by following the links. I'm a guest blogger on quilting gallery and I've written about my quilt appraising and collecting and quilt history along with photos. I also discuss my own quilt history, my new quilts and classes plus a bit about me and my family. Click on guest blogger above or on the guest blogger logo block to the right. 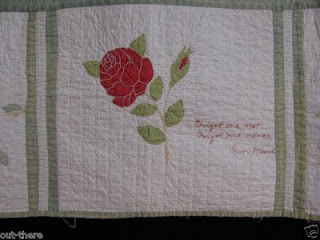 Here is the other quilt purchased with the whig rose quilt shown below. Right now I am recreating one block in a smaller scale for a project with fellow AQS certified quilt appraiser Pam Weeks. Duplicating old quilts does help one feel a kinship with earlier quilters. I can now really appreciate the amount of time it took to quilt an entire quilt with the 3/8 to 1/2" diagonal quilting this quilter did on this quilt as it is a lot of work on just a 9 inch block. It is hand appliqued and hand quilted, circa 1860. I usually try to be objective but I'm loving this new (to me) quilt, circa 1860. This lady sure didn't understand negative space as every inch is covered with applique and triple line quilting-fabulous. While this pattern tends to be very formal, this example is quite folky. 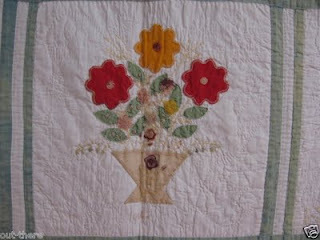 One of the cheeriest quilts with a great floral basket border. 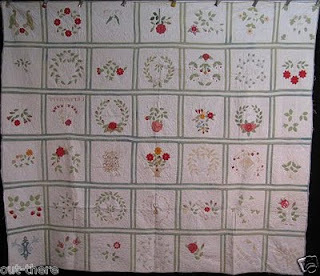 Circa 1860, 9 block whig rose, rose of sharon or democrat rose quilt.